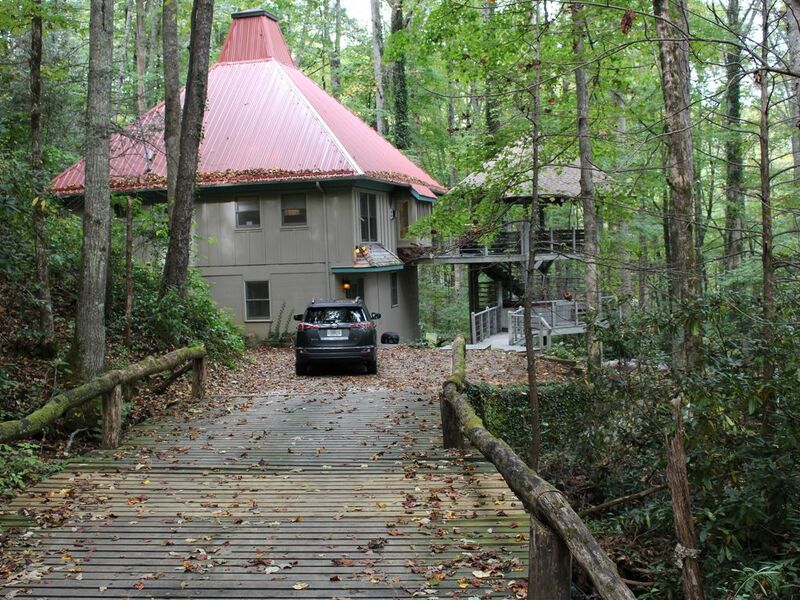 multi-family gatherings or couples looking for a beautiful mountain getaway. On the main level, the great room is a wonderful gathering space, from the rustic wood floors to the towering cathedral ceiling, complete with skylight and a spacious, secure loft that is a favorite spot for our kids. The great room is warmed by a gas burning Jotul fireplace, filled with comfortable furnishings and accompanied by a ‘smart’ TV system. Also on the main level of the home are two king size suites and a modern kitchen with maple cabinets and lots of counter space. The creek level of the home, renovated in 2016, has a cozy den with a smart TV entertainment system and ample comfortable furnishings. At creek level, 2 brightly-appointed adjoining bedrooms include queen and twin beds, respectively. Please take linen bed sheet off from beds and leave used towels on the bathroom floors. Take evey thing out from refrigerator. Leave the thermostat at 55 F during winter months. My family had a blast! We enjoyed exploring the area and sitting around the fire. We will definitely be back! It was wonderful. We will go back next year! The property with creek and woods was wonderful. Floor plan perfect for our group of six. Lower bedroom on right needs cover for ceiling heat vent. Dust and cobwebs blew all over bed when heat on. Two smoke alarms were missing covers, hoped they worked. Also need carbon monoxide dector with the gas logs. Did not see one. Beds were very comfortable, house was clean. Needed more toilet paper! Kitchen had everything we needed. Owners very helpful and so very nice!! Great place to stay and will recommend to friends. Beautiful surroundings, really comfortable house! My 3 closest friends and I were in the area to celebrate a birthday and wisely chose Falling Waters as our home base. It was perfect for us, with a great size, hot tub and fantastic amenities. Bruce and Nattinnee were very responsive and do a great job to keep up the property and provide everything you need. They made some great recommendations for local stores and restaurants. We highly recommend Frankie's for dinner and Joey's Pancake House for breakfast. We're already making plans to visit and book the house again! Thank you very for your sweet reviews and yes we do love Frankie and Joe pancakes so much as well. Great foods and good service. We hope to see your again next time. Had a great weekend with our family. Owners were quick to respond to our emails. House was comfortable, clean and ready for us when we arrived. The roaring creek on the property was a constant peaceful sound the window seat was perfect! We recently stayed for a weekend and loved it. The house is comfortable and well appointed. The property is unique and the stream adds a special oasis quality. Highly recommend. Had a wonderful long weekend despite the rain. The house is tucked back off the street and the hot tub is an added bonus.